This is the email address to which the plugin is licensed. Please copy and paste this information from the License Settings page in your Account Management Dashboard. This is the license key controlling the plugin is license. Please copy and paste this information from the License Settings page in your Account Management Dashboard. The Site Importer will cache pages retrieved to improve performance. If a cached file’s age exceeds this setting, it will be discarded and refreshed. Cached files are written to the temp folder. Set to 0 to turn off caching. When checked, if imported content contains a <h1> tag, it will be used instead of the page’s <title> tag. If no <h1> tag is present, the page’s <title> tag will still be used. When checked, if imported content contains a <h1> tag which exactly matches the page’s <title> tag the H1 tag will be removed. 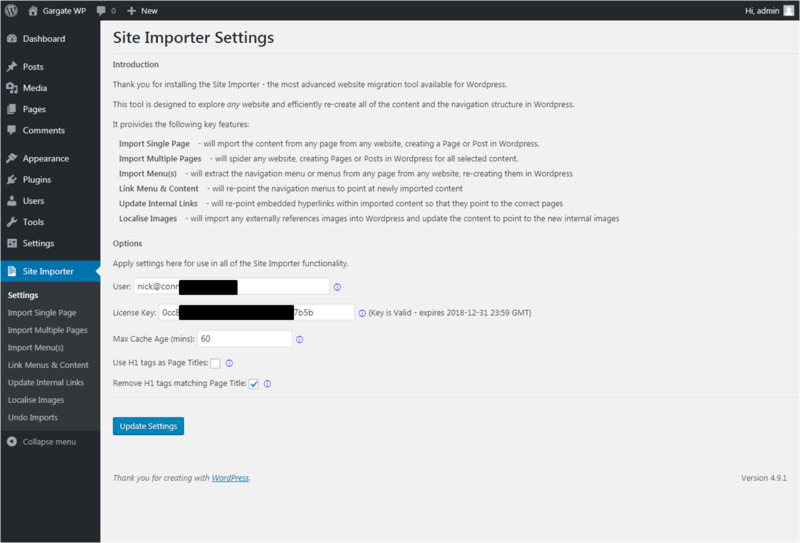 Some WordPress themes automatically include the Page title as an extra <h1> tag, so selecting this option avoids duplicated headings. If ‘Use H1 tags as Page Titles’ is also ticked, this will result in the first <h1> tag always being removed.